Many faculty and staff, especially those filling multiple roles, find their increasing use of email and email attachments makes it difficult to do University business and remain within their disk quota limits. While the ideas below won’t apply to all people or all situations, being aware of these strategies should prove useful to many. Depending on the program you use to access your email, deleting messages may not actually get rid of them – they may accumulate in your Trash folder and take up space you could use more productively. 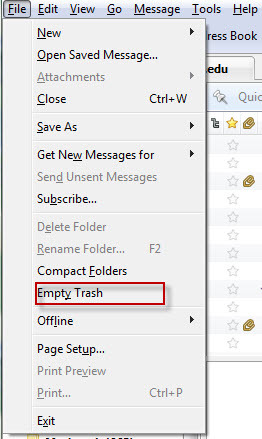 If you have messages in your Trash folder, your email program will offer an option to empty it. Example: in Thunderbird, select “Empty Trash” from the File menu. There are many circumstances in which partially-written messages are saved to a “drafts” folder. You should check that folder periodically and delete messages that you no longer need. Email programs save copies of every message you send. While many of these messages constitute an important record, it may prove worthwhile to discard messages beyond a certain age or with little long-term value. UCI gets a large volume of unwelcome commercial and malicious email and central UCI systems test and repel millions of messages a day. As a complement to this filter, each account has settings for spam (see My Email Options) which defines a threshold for considering a particular message to be spam, and may quarantine it for inspection and discard. If you have a spam folder, examine it and empty it regularly. If you have already checked that you haven’t lost space to spam and deleted mail, your University role may simply require more space than the default quota provides. 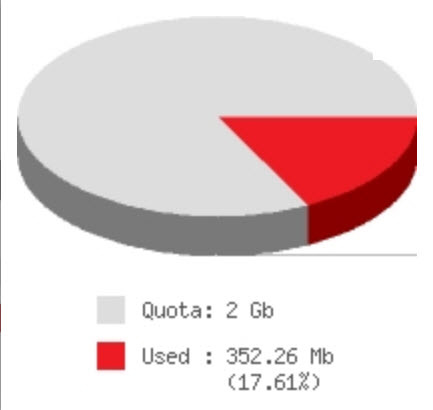 Contact the OIT Help Desk (oit@uci.edu, x42222) to review your particular disk usage and quota options. If you have multiple University roles, consider directing email for each role to a separate account. Quotas are applied to accounts, not people, and this may provide all the additional space you need, or at least protect one account with modest use from the email associated with another. Group UCInetIDs are available for a small monthly fee which can be used (for example) as mailboxes for deans, directors, and chairs. Most email programs offer the option of creating “local” folders – i.e., the ability to store email messages on the machine you are sitting at. The advantage of this is vastly increased storage, but it has the downside that email stored in local folders can not be accessed from other computers. The most common phenomenon that creates large mail storage is email attachments. Messages, even those with HTML and a few images, take up little space. Large documents, high-resolution images, sound files and videos consume your mail storage when they’re associated with your email as attachments. Consider storing your attachment as a local file and deleting the email that carried it. If you want access to these documents from multiple computers, consider storing them on OIT’s Webfiles service. OIT is ready to assist you in assessing your usage patterns and needs, and matching them to available options.